Lewis had arrived at the Great Falls of the Missouri. The grueling overland 18-plus mile portage of the falls was completed from June 22 to July 2, 1805. The men were exhausted and their feet bleeding from the spikes of prickly pears piercing through their moccasins every step along the way. On I-15 / US 87. 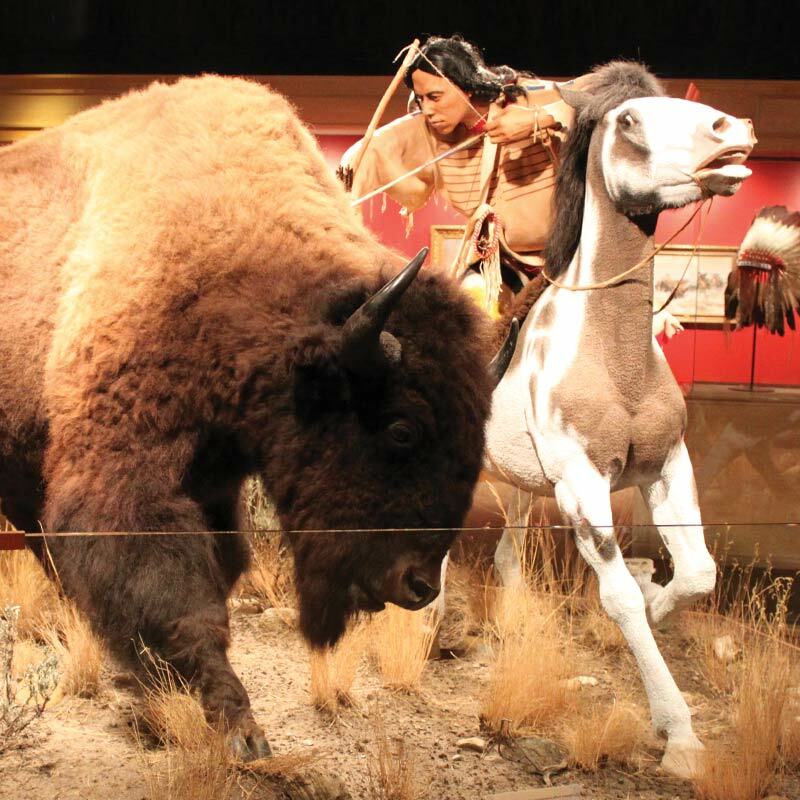 The Lewis & Clark Interpretive Center in Great Falls is a major stop along the entire length of the Lewis and Clark National Historic Trail. The overland portage around the five falls of the Missouri River was back-breaking work for the Corps and took a month to master. Four of the falls can be enjoyed today with walkways and scenic overlooks near the heart of the city. The National Historic Landmark marks the portage site. 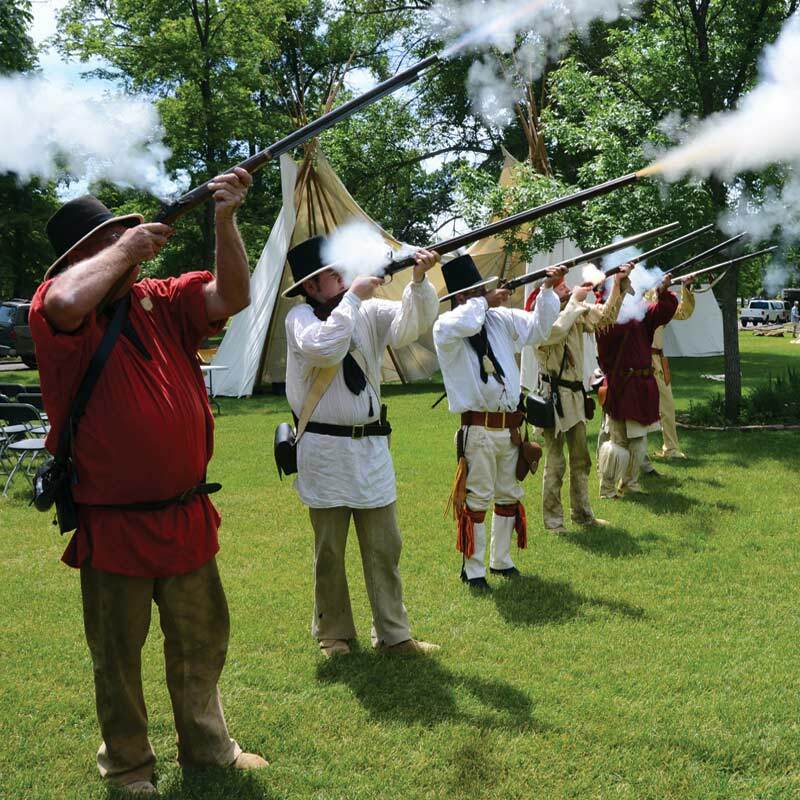 Great Falls is the location for the annual Lewis & Clark Festival in June that brings this epic story alive. Experience one of the world’s largest natural freshwater springs at Giant Springs State Park, and the Roe River, one of the world’s shortest rivers. The C.M. Russell Museum Complex features the works of America’s cowboy artist Charlie Russell. In addition to the museum’s galleries, the complex includes his original log studio and home. Great Falls is also the headquarters for the Little Shell Chippewa Tribe. Shelby is the home of the Marias Museum of History. The museum portrays the area’s history including when Captain Meriwether Lewis led a small party by horseback into the country to explore the Marias River on his return journey in 1806. On US 2. Browning is the main community for the Blackfeet Indian Reservation, home of the Blackfeet Nation. Browning features the Blackfeet Heritage Center and Art Gallery, the Museum of the Plains Indian, and North American Indian Days each July. Visitors can journey off the Trail to see spectacular Glacier National Park. On US 87. Fort Benton is a National Historic Landmark City and the gateway to the Upper Missouri River Breaks National Monument. The Monument and its Interpretive Center are key stops on the Lewis and Clark Trail. 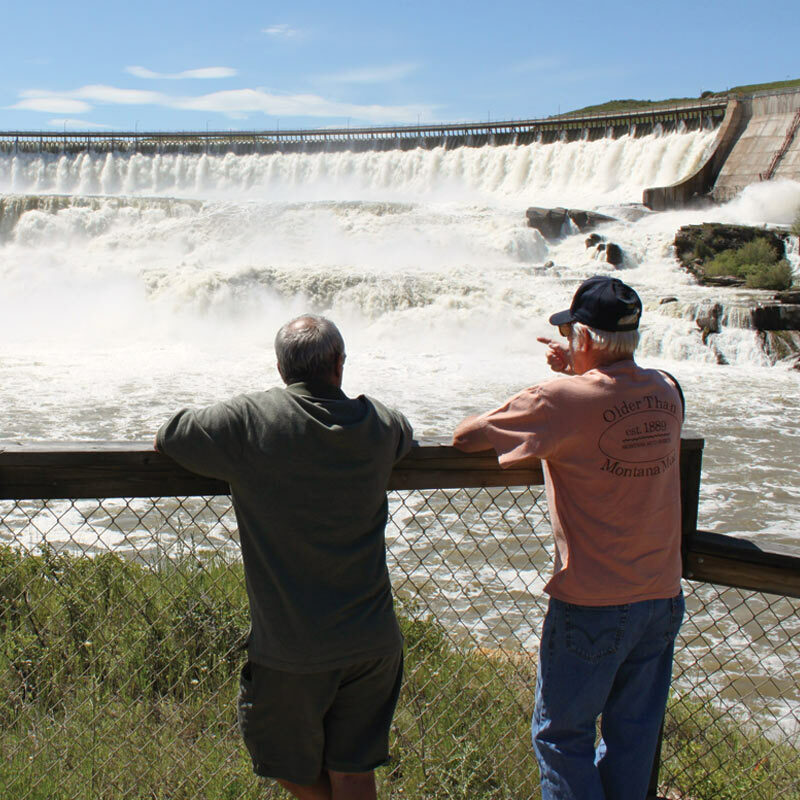 The monument parallels the Upper Missouri National Wild and Scenic River that runs 149 miles downriver. Fort Benton also includes the Museum of the Upper Missouri, reconstructed Old Fort Benton, the Starr Gallery of Western Art, and the Museum of the Northern Great Plains. Northeast of Fort Benton on US 87. Virgelle is the primary launch point for floating the wild and scenic portion of the Missouri River. An historic river ferry, bed and breakfast lodging and homestead rental cabins are available. Off US 87, south of Havre, in the Bear Paw Mountains. The reservation is the home of the Chippewa-Cree. The annual Rocky Boys Powwow is in August. On US 2. Havre features the 10,000-acre Beaver Creek Park, Fresno Reservoir, Havre Beneath the Streets, Wahkpa Chu’gn Buffalo Jump and Fort Assinniboine. 16 miles south of Chinook on HWY 240. East of Chinook on US 2. The reservation is home of the Gros Ventre and Assiniboine Tribes and is surrounded by the Little Rocky Mountains. Tours of the tribes’ bison herd are offered and the Milk River Indian Days powwow occurs in late July. Zortman is a Gold Rush town where visitors can pan for gold. Lewistown includes the Charlie Russell Chew Choo Dinner Train, plus the nearby ghost towns of Maiden, Giltedge, and Kendall. The Snowy and Judith mountain ranges run to the south and north. On US 87 from Great Falls to Lewistown. 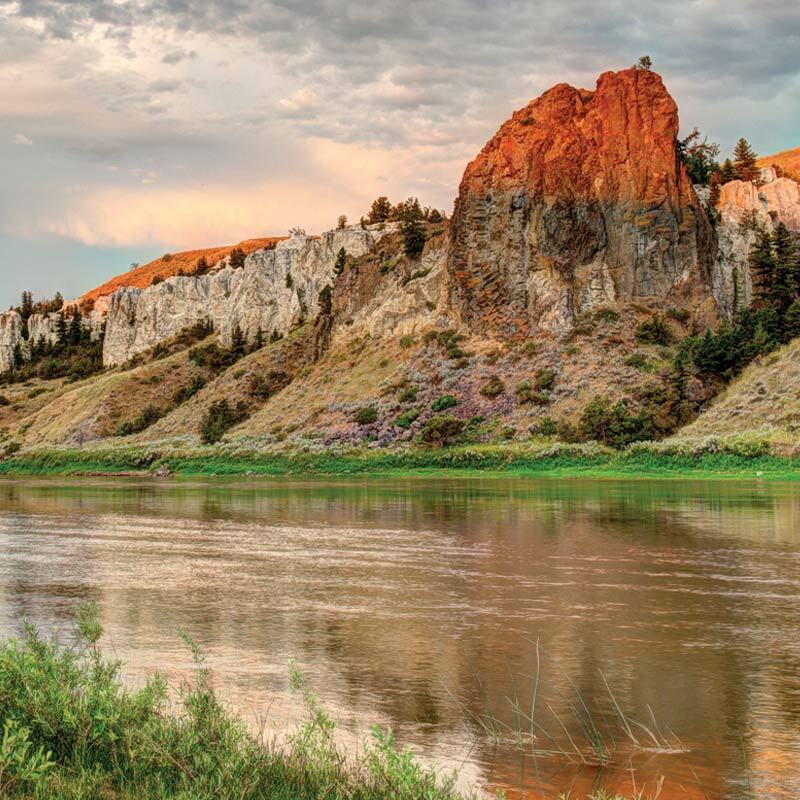 This scenic auto tour offers great landscapes that appear in cowboy artist Charlie Russell’s paintings and includes the Charles M. Russell Museum in Great Falls and museums in Stanford, Utica, and Hobson. South of Lewistown from US 191 then west on MT 12. Martinsdale features the Bair Family Museum, the former home of one of Montana’s most prosperous pioneers who made his fortune in the gold rush fields of Alaska. On US 12 and 89. The town features “The Castle,” an impressive stone mansion that is now home of the County Museum. The Spa Hot Springs Motel offers the opportunity to relax in three swimming pools filled with water from the natural hot springs. 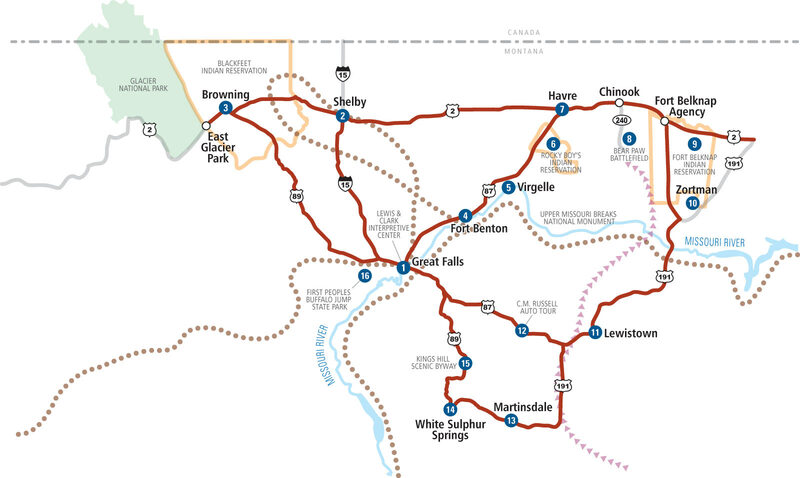 The Byway follows US 89 through the Helena/Lewis and Clark National Forest and the Little Belt Mountains over Kings Hill Pass from White Sulphur Springs to its intersection with US 87. The Byway leads to back country trailheads, lakes, scenic vistas, abandoned mines and Showdown Ski Area. Located just south of Great Falls off of I-15. The park marks the site where buffalo were stampeded by Native Americans over a mile-long cliff. Today the top of the cliff provides a panoramic view of the front range of the Rocky Mountains to the west and the vast Missouri River valley to the east. A visitor center at the base of the jump tells the story of the Indian Nations who came to this area.